What’s Anna and Elsa’s schedule? As of today, February 23, Anna and Elsa move back to another 9:00 am start time. It’s been rather confusing with them switching the schedule back and forth each week, but they are supposed to continue with the 9:00 am opening for the foreseeable future and hope to expand from 9:00 am to 9:00 pm soon. I recommend arriving at Epcot one hour before park opening and making a run to their location. Get a Fastpass+ for either Test Track or Soarin’ and riding the other late at night. If you are willing to split your party, you could FP+ Soarin and do Test Track as Single Rider. What’s going on with Tinker Bell’s Nook? Rosetta was supposed to become the de facto pixie to meet opposite Tinker Bell in the Nook this Spring, but something strange began occurring, other fairies began appearing randomly. Why is this? Well, you may recall that I mentioned a while back that Tinker Bell’s Nook will eventually close and it will be ONLY Tinker Bell at Town Square Theater. So, the Magic Kingdom is allowing guests some final opportunities to meet the other fairies rather randomly over the next few weeks. Will the new Pirate Fairy appear at Walt Disney World? When is Character Palooza on X Day or in X Month? I get a TON of people asking me when Character Palooza will be when Fantasmic is a certain time (many not listed on my site) or in a certain month. I try to only provide details that have been provided to me and that I have observed or friends have observed. It’s a totally unpublished meet and I have to do some digging to find this information. The basic rule is that the first Character Palooza occurs 4.5 hours before the LAST Fantasmic of the day, but it may not be exact. With that said, I just don’t have the time to answer all the questions about when it MIGHT happen in June, on a certain day of the week or in 2015. I’m not trying to be rude, but I do work a real job and have a family and can’t answer every question for someone hoping to hyper plan their day in June, July or August. I provide the information each week in my app and have a basic overview on this site. If you don’t see it here, it’s because I don’t have that information yet. Please understand that I don’t answer every question concerning a character’s meet and greet time, because all that data is in my app and is linked to on this site for free if you don’t wish to purchase the app and support the site. Thank you for understanding! Thanks for all the great info! We were able to meet Anna and Elsa Saturday morning. I left our breakfast at 8:48 while the rest of my party finished eating. Unfortunately I only got to see belle since our reservation was 8:25 but I did get to eat. The rest of my party joined me in line around 9:15 and we met the princesses by 9:35. I was probably the end of the first row in line. And character palooza today was great! They came out around 5:40 and today it was genie, Minnie, max, Stich, Jessie, meeko, penguins, green army men, queen grimhilde (Snow White queen), gepetto and Pinocchio and belle. There might’ve been one or 2 more but I forgot. Thanks for the info!!! Thanks so much for this post. We are headed to Disney the week of March 16th. First time for both kids!! My daughter is obsessed with the fairies so I’m really hoping she will get to me more than Tinkerbell. I’m surprised of the closing of Tinker Bell’s Nook. The new movie is set to be released early April. We are scheduled to go to Epcot on a day when the open early, 8am. Do you think the Frozen girls will still show up at 9am? Do you have any update on how long the wait has been first thing in the morning? Yes, they start at 9am everyday. I would go straight there when emh begins for the shortest wait. Hi Kenny….Just wanted to report back after coming back from an amazing vacation. We did MK 3 days (took our time with 2 little ones) and went to Tink’s nook every morning. We were lucky to see Vidia, Rosetta and Silvermist. I also took your advice and went straight to Norway at 8am on Tues and we got up to see the sisters by 9:30. Not bad and it was a dream come true to my 4 year old. I saw your post about the Character Palooza on Thurs in Hollywood Studios. I’ll be honest I totally missed your previous posts about the secret event. The funny thing is that we were at Hollywood studios on Thurs and left the park around 5:30 so we totally just missed it. The only one that I was sad that we missed was Jessie. My daughter would have loved to see her. I think we got most of the others during the week. Thanks again for all the tips!!! Look forward to our next trip. Love your website! 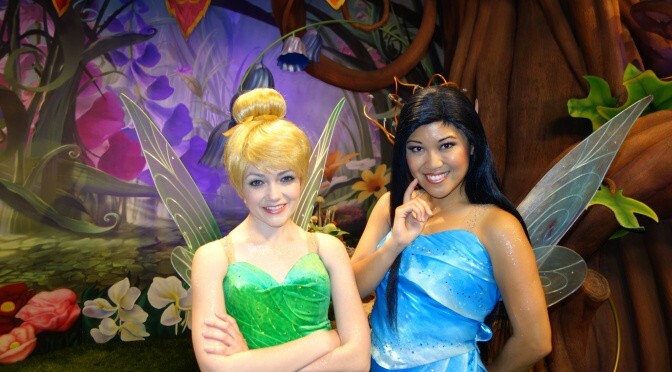 Vidia was there tonight (we saw her) and our friends saw Fawn two days ago with tinkerbell! Hoping we get to meet Rosetta! Or one of the other fairies….! We were at the parks on vacation last week during East Coast school winter break. The lines were 4+ hours to meet Anna and Elsa at Norway. We were so disappointed that they changed to 11am because we planned an early breakfast at Akhersus to get in early. We didn’t even bother with the line but took pictures of them from the shop. However, I am on the phone right now with Disney making a change to my next resort reservation and he told me the Frozen characters are now in Fantasyland. I don’t see that reported anywhere else. Could he be right? Any idea how the lines for Elsa and Anna are later in the day (say around 4 or 4:30)? Or have they generally already cut off the line at that point? Thanks for all the info! It really depends on the day and the crowds. I always recommend going at park opening, but you may experience a decent wait later in the day. Thanks! You’re the best, as usual. Kenny, does the weekly schedule here run Sunday-Saturday? I’m headed down Thursday and I’m doing the Anna/Elsa meet this Saturday as part of my four parks/one ride/one character meet/one meal or snack/one day challenge. (It’s way harder to type that than I thought.) Wondering if it’ll stay at 9a or if they’ll switch back to 11a again. I hope Vidia is there on the 6th. She’s my daughters favorite! Thanks for all the info! I have to say for anyone visiting the parks who want character info BUY THE APP! I have used the Character Locator app twice on our visits and LOVR it. It is WELL worth the money…and really if you’re spending thousands on a trip already will a few bucks kill you? Thank you so much for all your information and for working hard to keep it updated! We managed to catch a character palooza one afternoon. Talk about an amazing experience!!! I have never had character interactions like that!!! The next time we tried we must have missed it or it was canceled. Either way, we appreciate the tips and all the character work you do!!!! PS: your Anna and Elsa info is THE BEST! We got to see them and it was totally worth it! We have yet to meet Silvermist or Fawn or Irredessa…. so sad we might not get to! Too bad we aren’t there over the next few weeks! Thanks for all the great info! Thank you so much for the info Kenny! It’s always a big help for us. I did want to ask, when you say the fairies will be meeting randomly over the next few weeks, do you have an estimate of when that will stop? I’m really hoping that the random fairies holds over until Spring Break. I haven’t received a date when Tink will move and don’t know the actual rotation of pixies. I’ll let you all know when I hear a move date. Thank you so much Kenny! I’m a huge fairy fan and I’m ridiculously depressed that they won’t be meeting at all but I’m going to try to see them as many times I can before they go.